April 14, 2016 by Adrian H. Wood, PhD. of "Tales of an Educated Debutante"
There are no more toes like this at my house. 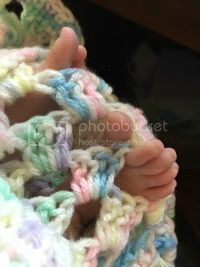 I have always been fascinated with the littlest of feet, eager to mark the spot on the fresh blank page of each baby book. Then, as I was filled with a rush of creativity, I would take off socks and paint tiny toes and little feet for Christmas ornaments or parent directed paintings. Evidence of my amateur photography documenting my oldest son’s toes adorned with pink nail polish, another son’s toes peeking from his baptismal gown, my daughter’s toes half in her mouth and my youngest child’s toes….Well, if I remembered to take one, it is locked away in a hard drive somewhere. Soon though I will be saying good bye to the last set of little feet in our family. The ones that outgrow shoes every month and already are dark with playground dirt on warm afternoons at our community playground, located on the Albemarle Sound and plenty of dirt, sand, and grass to stain once clean feet now grubby with nature. The evening bath water tinged tan with dirt between growing feet and once clean, pink and new remind me of what seems like long ago. I still have a chance to capture a picture of these feet as he’s not yet three and his toes still find their way to my mouth and my fingers still elicit peals of laughter as I count each piggy. The first toes in my house are nearly as large as mine now and live in tennis shoes that are no longer navy or red, have old fashioned buckles or look perfectly wonderful with neat white knee or ankle socks. Sigh, those feet clomp around in brightly colored tennis shoes or the occasional topsiders, for special occasions like Christmas Eve. The shoes of my big boys are often tossed outside after school, the aroma distinct and murderous. I smile as I remember my mother, while driving carpool, instructing my brother to put his shoes back on as she smelled the silent action in the backseat. My daughter adores neon pink running shoes and her newest pair of “Cleopatra” shoes as the annoying lady pointed out at the children’s consignment shop, straps of gold with faux turquoise gems. Oh my. I long for those days of little toes, ones that fit neatly in the palm of my hand and required no socks or shoes, tucked in wonderful outfits with built in feet. Remember how the first socks would fall off? No shoes available or wanted for the darling feet and soon there would be leather soft soled shoes, then ones with a bit of elastic for learning to walk. Hard white baby shoes came next at our house, even down to the bells tied on laces so as not to loose stealthy toddlers that have roamed the halls. Black and white saddle shoes and navy sanders adorn my two year old son now, the red shoes worn by his older three siblings await in the shoe basket tucked in the bottom of his minuscule closet. The transition of baby toes is evident and I will say my good byes, this time, thankful for the knowledge to appreciate the window of joy they have offered me. Adrian H. Wood is a wife and mother of four, the youngest with extra special needs. In writing after a twenty year hiatus, she offers personal glimpses where satire meets truth, faith meets irony, despair meets joy and this educated debutante escapes the laundry and finds true meaning in graceful transparency. You can read more of Adrian on her blog Tales of an Educated Debutante. You can also follow Adrian on Facebook, Twitter, and Instagram.